In their comprehensive global bed bug study, the National Pest Management Association and the University of Kentucky confirmed that bed bugs are spreading rapidly throughout the country. 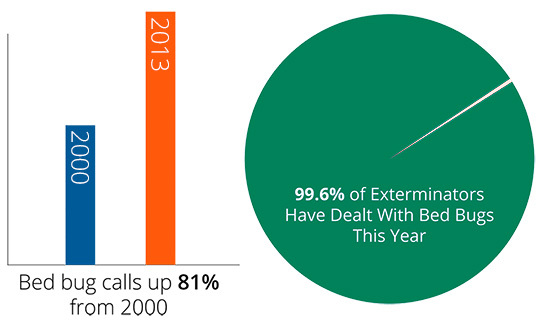 Bed bug calls to pest control companies are up 81% from 2000, and 99.6% of companies interviewed in 2013 state that they have encountered an infestation in the past year. The report indicated that bed bugs are most prevalent in urban areas with high populations, due to their ability to travel from place to place via clothes and luggage. Only 52% of pest control companies reported treating for bed bugs in rural areas, compared to 71% in cities and over 80% in suburbs. Most companies agreed that bed bugs are the most difficult pests to treat, more so than cockroaches and termites. Travelers are especially vulnerable — 75% of the 1,000 pest managers surveyed have treated bedbug infestations in hotels. The NPMA is a non-profit organization that was established in 1933 to support the pest management industry’s efforts. For more information on bed bugs by the NPMA, visit their website.